THE modern "quasi" jewellery sold in the streets is remarkable alike for its variety, its artistic beauty, its marvellous imitations of real gems and ornaments, and its fashionable designs. It is, indeed, necessary now-a-days for the street vendor of jewellery, to exercise tact and judgment in selecting such wares only as are supposed to be in vogue among the upper classes of society. "It is not so much the. imitation jewels the women are after," said an old dealer to me, "it's the class of jewels that make the imitation lady. As for the men, they're all there when they got the ring of the aristocrat on their unwashen finger; fit for Court they be, and fit for courting. The ring goes down uncommon with the girls, specially the plain hoop, sir!" The ornaments which find the readiest market are combs for the back hair, ear-drops, finger-rings, scarf-pins, brooches, and bracelets; to these are frequently added a miscellaneous array of larger and more costly articles. 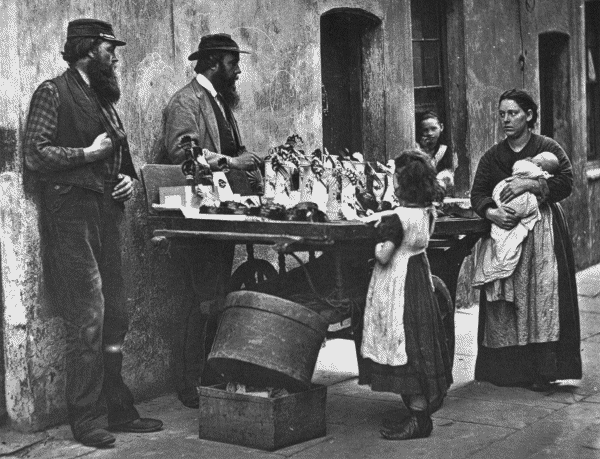 The best harrows and stalls in Whitechapel, the New Cut, and Tottenham Court Road, display vases and other mantelpiece ware, gilt frames for "carte" photographs, leather and bead purses, and in some instances plated jewellery. Within the last ten years the fancy-ware trade - popularly termed "swag-selling"- has proved one of the most lucrative branches of out-door industry. The fabulous profits it was supposed to yield, and the small outlay required for stock, tempted so many of the street folks to take to the "swag-board," that the trade has been overdone, the market glutted, and some of the old hands forced to abandon the streets and take to indoor employment. There can be no doubt that the profits on the sale of cheap jewellery are still large, but continued depression of trade, and the number of hands employed in selling have woefully reduced the returns of each individual trader. I obtained the following account of the present position of the "swags" from a man who had been brought up to the business. "It is now much harder to make a living in my line than it was ten years ago. Most things is dearer in the feeding way, and the profits ain't nothing like wot they was. They ain't so bad, took as we sell, but we don't sell nigh so much o' the most paying things, and a sight more things that's got next to no bounce - profit - 'cause every 'swag' sells 'em. But at the worst o' times I'll back myself again any cove' to make a living; I sell so cheap I've broke the h'arts of every blessed 'swag' in the Cut. I've drove 'em out in the cold, and they hate me as 'pison,' so I've hurd; but I don't care, it's business not pers'nal' feelin'. Wot I does is this. It's my little game always to have a new 'chut' - a novelty - on my barrow. The one I got now is sleeve - links, brooches, studs, and lockets, all at a penny." I bought several articles at this man's stall at a penny a-piece, all of which I should have appraised at a much higher value. Such ornaments, indeed, had they been offered for sale twenty years ago, would have commanded ready purchasers at a shilling a-piece, as astounding examples of the cheap products of skilled labour. Perhaps the most ingenious and attractive pennyworth was a pair of sleeve-links, each containing a dog's head moulded in coloured glass, and protected by a convex glass neatly set in a gilt and burnished rim of metal. Upon expressing my surprise at the trifling cost of the wares, my informant continued,- "You ain't in my line, I believe, sir? and I don't mind your printin' wot I say in a book, cause most swags don't read, - they can't. You won't split on me, so I'll let you up to one or two things. Them goods you see, they fetch a tidy bit o' money. They cost me sevenpence a dozen, that's fivepence a dozen profit. The 'bounce' ain't much, but when a senseless swag would take his barrow home on a wet day, and wait for fair weather, the missus and me we take our baskets and tramp round out o' London and in o' London to places wot want workin'. Goin' from door to door we makes the thing pay, gettin' at times twopence for wot would fetch a penny on the barrow. The extra penny goes for the railway, a drop o' drink, and such like. It's a poor business now, but by workin' twice as hard as before, it's about the same when the week's done. Sunday to most on us is a day for loafin' and liquorin'. I'm workin' a thing now at half 'bounce,' and I've a new 'chut' comin' out, same as the links, only more better got up to my eye. I bought it, as I buy everything else, from the Jews in Houndsditch and such like places. The Jews are fair people at a deal so long as you pay. But they'd never trust a man like me a penny to save my life. At the end o' the year I got sixpence on the pound from some of em on my year's buyings. That's their dodge to get me to stick to 'em. In fine weather I make most money by travellin' the country. The gals and green- horns there don't know the 'wally' o' things, and come down with sixpence easy for wot fetches a penny here." The accompanying photograph represents a street group gathered round a dealer whose barrow is one of the most attractive I have seen during my wanderings about town. The story of its owner was narrated to me in the following words :-"I was brought up in the country as a miller, and earned in good times sixteen shillings a week. Seeing no prospect of advance, I came to London. Ten shillings was all I had in my purse when I left home to make my way in the world. I had heard wonderful tales of London, of its wealth, and the chances of fortune it offered to all. Besides my stock of money I carried more than money's worth in two characters I had from the clergyman and my master. They spoke well of me, but nobody cared to look at them. Only twopence halfpenny remained over of the ten shillings. I had been four days wandering all over the place in search of work. Ten shillings may seem a large sum to spend in four days, but it cost me three and six in the railway to come up here. Just when I was feeling desperate, fit for anything, I got a job at eighteen shillings a-week. I kept this place for two years, a sort of labourer; at the end of that time I fell in with my wife, and got married. She had a stone-ware shop. We kept the shop running together for about four years, but it run down one morning all along of three other shops that set up in the same street, one at each end, and one in the middle. The competition knocked us over, and we were sold up. Out of the wreck of our business I saved about fifteen pounds and some sticks of furniture. With this I started 'swag' in the streets. The whole of the money was invested in a barrow and stock. Business at that time paid better than it does now, and expenses were not so high. Four years ago I got three shillings for a comb that will only fetch a shilling now. The first cost to me was a trifle more than it is now, but nothing compared to the extra profit. My class of customers, when trade was prime, had more money than they know'd what to do with, in consequence they used to chuck it about freely and foolishly. There are now too many 'swags,' and most of them ain't the gentlemen they used to be. I should say there are 1500 swag dealers about London, counting women, boys, and girls. The average clear profits all round would, I think, be about fourteen shillings each a week. My missus and myself between us, we make clear over thirty shillings a week. It takes about thirty shillings to keep us, five shillings a week rent, and the rest for clothes, food, and fuel. Three or four years ago I have drawn as much as two pounds on a Saturday night. Out of that I had about twenty-six shillings profit. Now I have not been drawing more than five shillings a day, except on rare occasions. The profits are much lower at present. Ten shillings out of the sovereign is considered good now. The profit is not so great as it looks, when you think of how long we stand and how many are the folks we supply before we get a pound. It must take about fifty customers to make up a pound of money. Times are bad, and I have left the streets for a regular job. My wife minds the barrow. But bad as times be, it's wonderful how women will have ornaments. I have had them come with their youngsters without shoes or stockings, and spend money on ear-drops, or a fancy comb for the hair. Some women deal with me for wedding-rings. I sell them gilt from a penny to threepence. I have sold two dozen of them in a night, some for a lark, others for weddings, and a lot to wear in place of the genuine wedding-rings pawned for drink, so as not to let the husband know. I have often sold sixpenny rings for weddings. They are uncommon high-class goods, and warranted to fix a pair as surely as the genuine article. "I can supply a set of real flash jewels for about three shillings - diamonds if you like, brooch, bracelets, black or gold ear-drops, and finger-ring. The finest plated articles, fit for carriage people, fetch more money. A pair of ear-drops of this sort fetch two and six or three shillings. It's only tip-top dealers like myself that keep them. "I now sell my best fancy combs for a shilling; they fetched three shillings when I bought them for a shilling. I now pay eightpence a-piece for them, and sell them for a shilling. I have them for the hair as low as twopence-halfpenny. They are in great demand among young women, who would go a'most naked, and feel comfortable, if only their hair was done tip in the latest fashion, and decked with one of my combs. I have known them 'swop' their underclothing for a comb when their toes was sticking through their boots. Girls on the street are my best customers. They think nothing of money and give it wings when they get it. "Saturday and Monday nights are our best times; when the people are looking through a glass of gin our things look wonderful tempting, and their little bare-footed youngsters look clothed and warm. I wish I was a better judge of human nature; some gentlemen in my line can tell when a man or a woman has money, and tempt them to the barrow, where they're sure to leave some of their 'tin.' I can't do it, I have always been unfortunate. I have never had a run of luck. There's something about me like a stone round a drowning man's neck, keeps me from rising. I had a bit of education, and am fit for better work, but it seems never to be my lot to get fairly clear of the streets. Some drink hard and get on, I don't lush and I don't get on. I got a situation the other day only for a short time. The work is done and I am discharged. I must here take leave of this dealer, joining him heartily in the hope that better days are in store for him, that his industry may yet be rewarded with the modest degree of success to which he aspires.